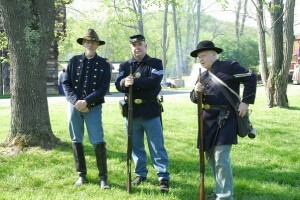 The WVRA held it’s annual School of the Soldier at Prickett’s Fort, near Fairmont, WV over the weekend of April 30, 2011. The weekend was well attended and the weather was pleasant. 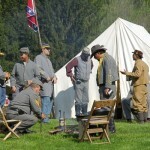 The fort is a good location for this sort of event for a number of reasons. There are numerous historical connections to the area from the late 18th Century on up. 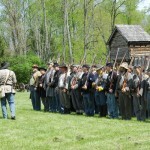 There is an attractive antebellum brick house on the property which offers an appropriate setting for Civil War living history interpretations. In past years, we have celebrated a Civil War Christmas at that location. 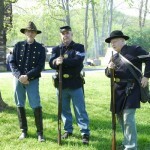 The restored fort, of course, predates the Civil War by at least 70 years. 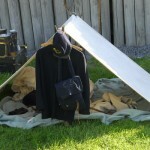 There are full-time living historians who work at the fort and offer presentations to the public for a modest admission fee. There is also a well-appointed visitor’s center and a rustic amphitheater. 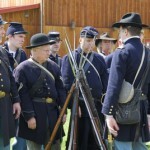 The grounds between the fort and visitor’s center gave the reenactors an excellent parade ground for marching and drilling over the weekend as well as artillery demonstrations and skirmishing. 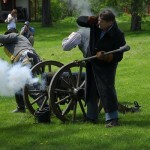 Because of the the fort, we also had quite a few interested spectators for the weekend’s activities. This was a win-win situation for all involved and hopefully will be a location we can use for this purpose in the future. 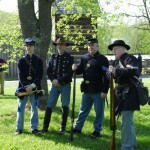 There are regular featured attractions at the fort throughout much of the year as well as the day-to-day historical interpretations. I recommend it as a good stop for the historically inclined. Special Thanks to Ruth Rowland for the pictures.